When I went to see Dr. Ozawa he told Papa that I need to do more exercise. Since some time ago I wasn't using my cage wheel anymore because I like making my nest just in the corner behind it and it cannot move because I like to put lots of tissue paper under it. 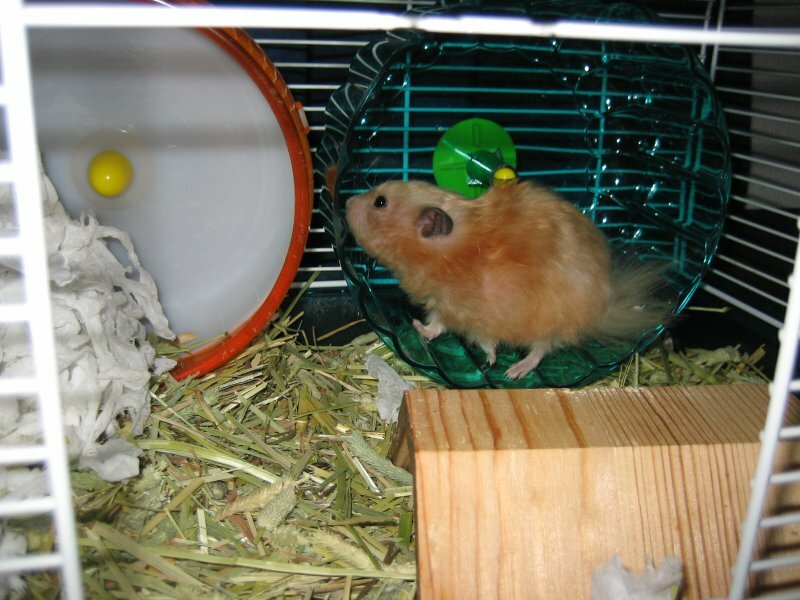 I did exercise only when Papa took me out for playing and sometimes when I climbed to the bars in my cage. 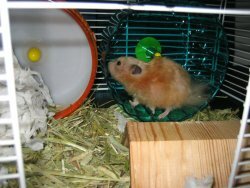 But today after I went back to my cage after playing outside I found a new wheel inside my cage! I tried walking on it for a while and it works nicely. Papa told me that I should run a lot on it so I lose weight, but I just felt like walking for a while. Then I went back to my warm nest. Thank-you for your updates. My hammy died a peaceful death today, and I needed to lift my spirits, I came here and what do you know? a new update. Keep rockin' those haammy posts. R.I.P. for our dearly departed. Hey, top-of-the-line wheel you have there!! Nice!!! Sweet deal!! It sounds like she might like a critter crawler. They are safe and easy to use and it helps to expand the play-time because you needn't hold her wll the time while she is using it. flan says: "but I just felt like walking for a while. Then I went back to my warm nest."